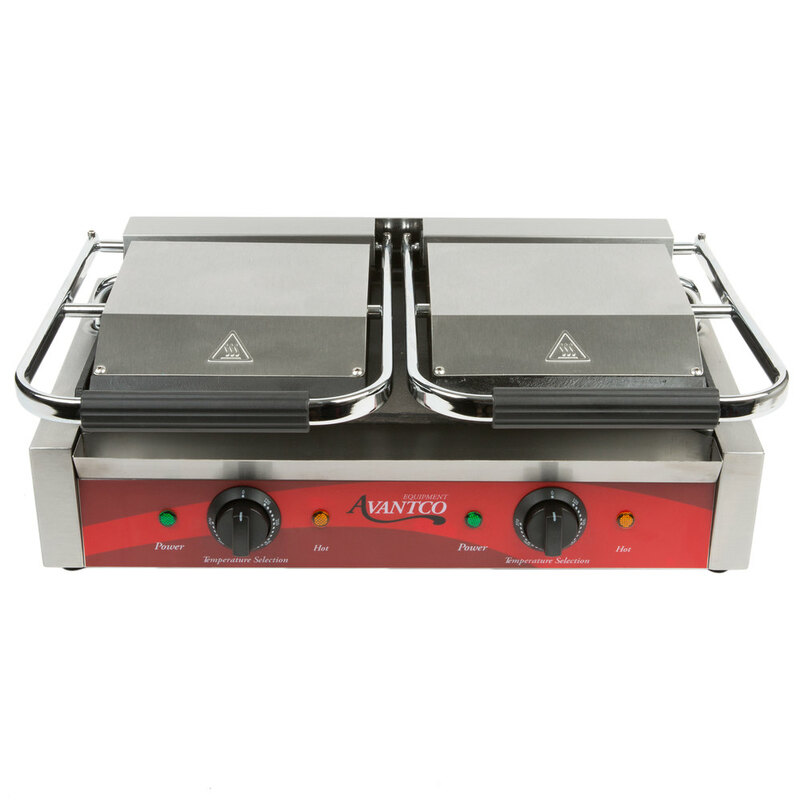 Create your most popular sandwiches, quesadillas, hamburgers, and more with the Avantco P88SG double grooved top and smooth bottom commercial panini sandwich grill! 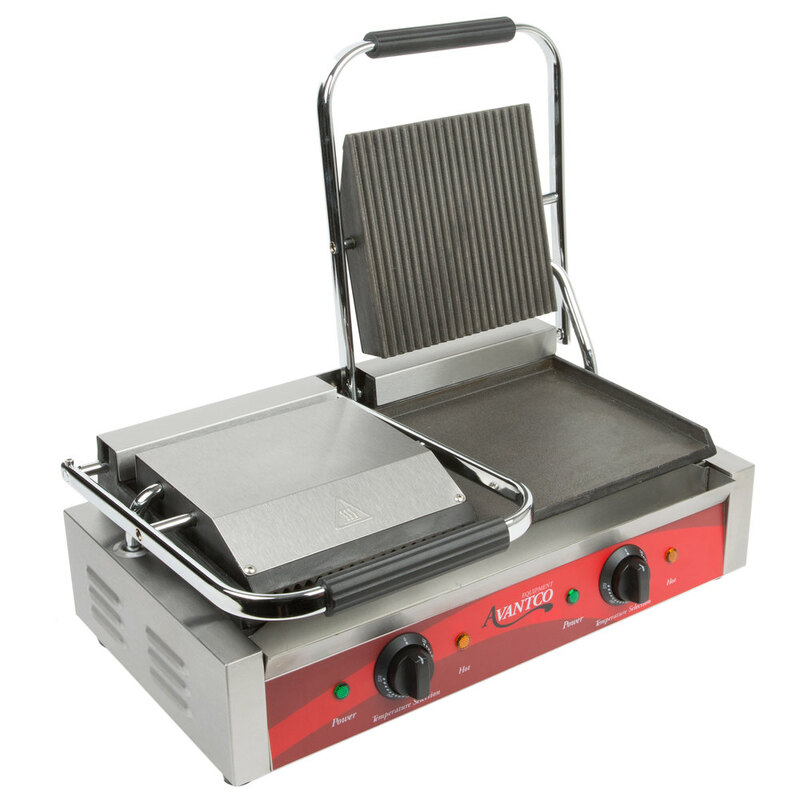 This sandwich grill features 3500 watts of heating power for fast and thorough cooking. The top grooved grill plates provide tantalizing grill marks for an excellent presentation, and its smooth bottom plate ensures complete contact with your product and consistent, even heat supply. For outstanding performance, the double grill design enhances your kitchen's efficiency. 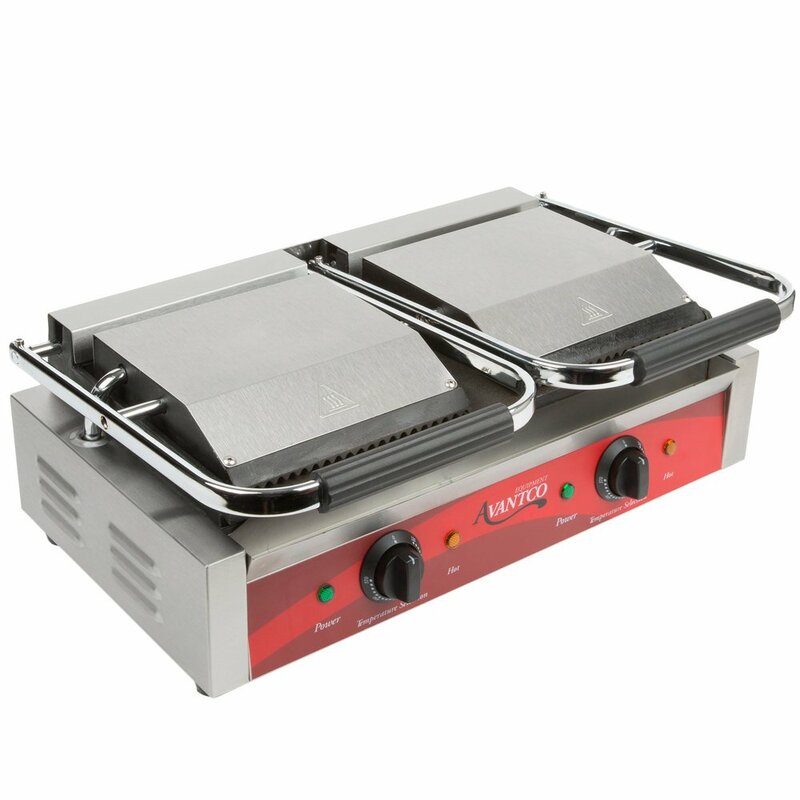 The temperature is individually adjustable between 120 and 570 degrees Fahrenheit to cook or warm a wide variety of foods, while the stainless steel exterior and cast iron plates ensure long-lasting durability and strength. And thanks to the included drip tray, cleaning up is a breeze after every use. This unit is supplied with 2 plugs and must be operated using 2 separate 120V circuits. 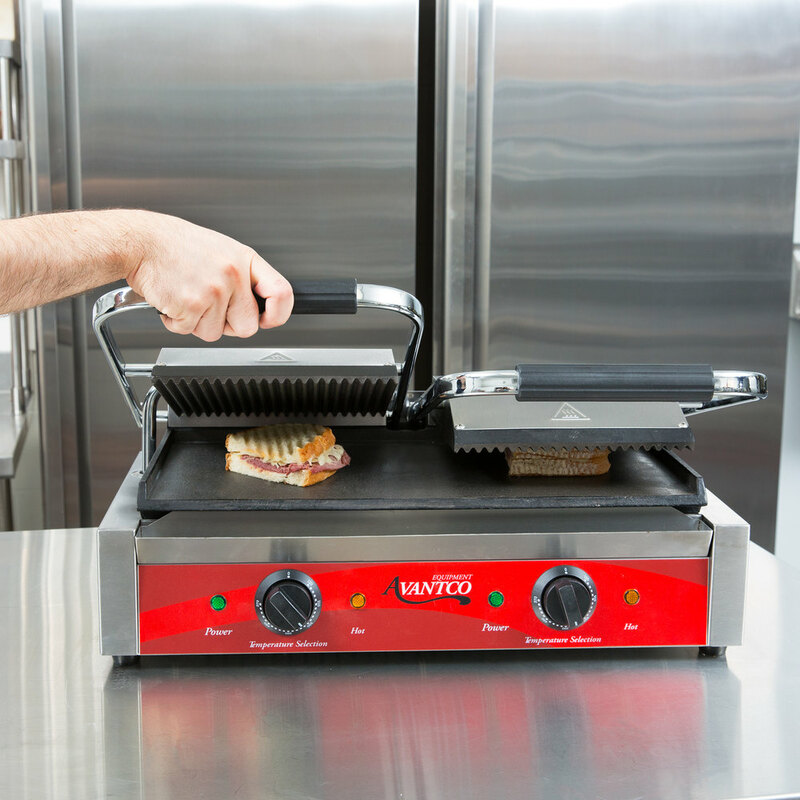 We love this panini press! It was a great addition to out coffee shop. 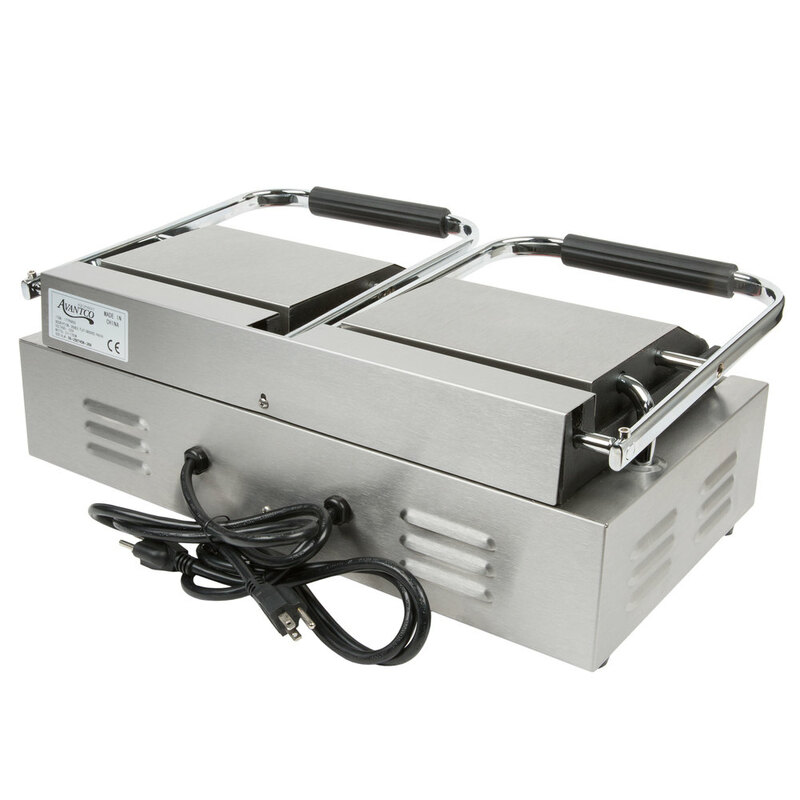 It works great for grilled cheese, toasting bread, or any sandwich that needs to be heated. Definitely recommend this product. We use this grill to make panini in our wine bar. The dual zone is great as we often heat sausage on one side while making panini on the other. The machine is heavy duty and I can't imagine needing a more expensive model when this one works so perfectly. Would definitely buy again! This grill is pretty much the heart and soul of our daily lunch operation. Smooth and reliable performance plus even grilling have been so appreciated. This grill is nice, it isn't too bulky and it give you much more space to accommodate the demands quickly. the only draw back was not knowing it uses two plugs. otherwise it is great. This is one of our favorite pieces of equipment. Our cooking needs are limited and small but thing does it all! Extremely durable and well constructed. Its twice as heavy as I expected it to be and it needs 2 separate circuits, but its worth every bit of extra effort setting it up. Easy to clean, highly recommended! The heating element works really well however after 4 weeks of consistent use, the hinges stopped holding up the top of the press which is really inconvenient when you are trying to put food on the grill. Great panini grill. Keep temperature long and work really fast. Only criticism would be that you need two outlets on the separate circuit. But other than that, if you solve that problem, you will be highly satisfy! Received the panini press today. Press is heavy duty and in good working order. Can't wait to start using it in my cafe. Thanks a million. 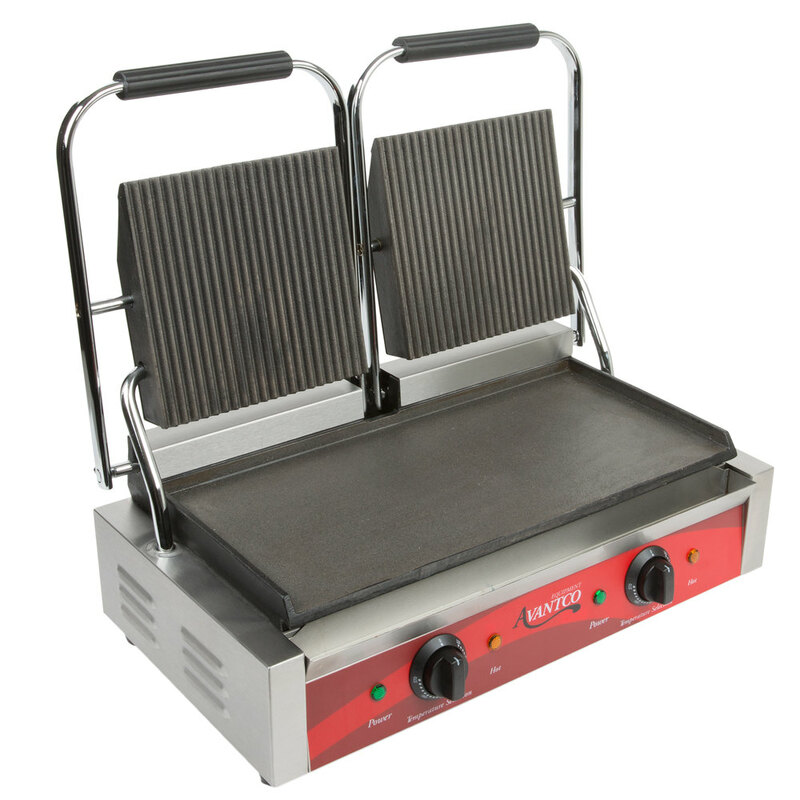 We purchased two of these panini grills and they worked great for about 8 months. After 8 months, they lost their temperature control and the cost in fixing them was equivalent to the purchase of a new one. Unfortunately for us, the warranty is a 6 month warranty, thus, they were not covered under warranty. We even alternated which panini press we used throughout the week to spread out the wear and tear of these, expecting that with that procedure we could extend their life by at least a year....nope! Didn't even last a year. I believe these to be a good purchase if you are operating a very small volume commercial kitchen. Otherwise, spend the bigger money on the higher quality equipment. Great edition to any small kitchen. We don't have a flat top in our restaurant and this is the perfect inexpensive option for adding variety to our menu. Highly recommend this press. We had been making do with a home model and this press easily cuts our prep time in half. We considered the double groove plates, but are so glad we went with the flat bottom for ease of clean up. I wish there were options for removable plates, but I imagine they don't heat as well or as evenly. Only problem is how heavy it is, but it's what I would expect from solid cast iron. This panini grill is great! It heats quickly, and cooks evenly. When we saw the low price were were a little bit hesitant as to whether it would be a good fit for our cafe. It does great!